Last September, I shared some very encouraging data showing how extreme poverty dramatically has declined in the developing world. And I noted that this progress happened during a time when the “Washington Consensus” was resulting in “neoliberal” policies (meaning “classical liberal“) in those nations (confirmed by data from Economic Freedom of the World). In other words, pro-market policies were the recipe for poverty reduction, not foreign aid or big government. Sadly, the Washington Consensus has been supplanted. Bureaucracies such as the International Monetary Fund, the United Nations, and the Organization for Economic Cooperation and Development are now pushing a statist agenda based on the bizarre theory that higher taxes and more spending somehow produce prosperity. To add insult to injury, some people now want to rewrite history and argue that free markets don’t deserve credit for the poverty reduction that already has occurred. Esteban Ortiz-Ospina, writing for Our World in Data, wants readers to conclude that redistribution programs deserve credit. …the share of people living in extreme poverty around the world has fallen continuously over the last two centuries. …many often say that globalization in the form of ‘free-market capitalism’ is the main force to be thanked for such remarkable historical achievement. …this focus on ‘free-market capitalism’ alone is misguided. …Governments around the world have dramatically increased their potential to collect revenues in order to redistribute resources through social transfers… The reach of governments has grown substantially over the last century: the share of total output that governments control is much larger today than a century ago. And for evidence, Mr. Ortiz-Ospina included this chart. So does Ortiz-Ospina have a compelling argument? Does poverty go down as welfare spending goes up? Nope. Johan Norberg points out that there is a gaping flaw in this argument. An enormous, gigantic hole. Wow. This isn’t just a flaw. It’s malpractice. 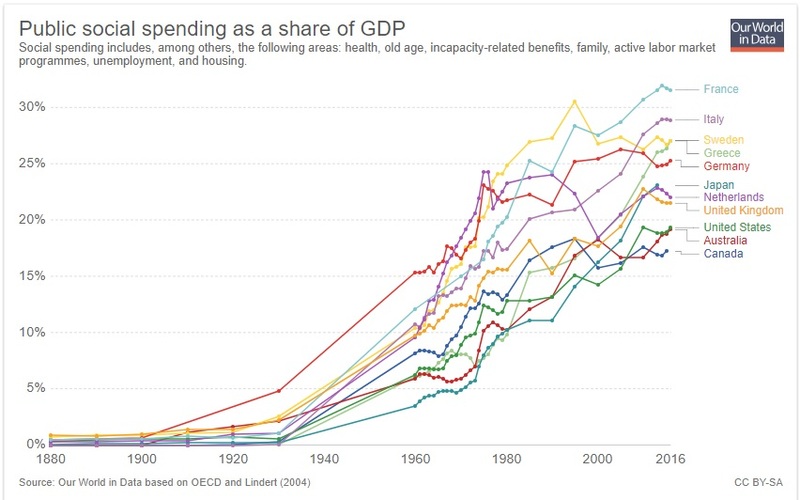 It’s absurd to argue that welfare spending in developed nations somehow led to poverty reduction in developing countries. I hope Mr. Ortiz-Ospina is just an inexperienced intern, because if he really understands the data, one might be forced to conclude that he’s dishonest. But let’s set that issue aside. 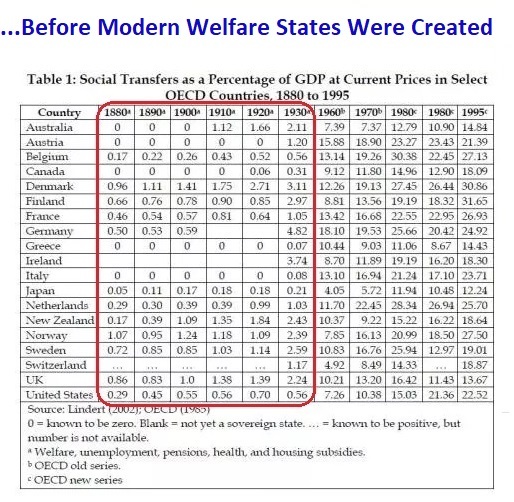 Johan closes his video by explaining that poverty in rich nations declined before modern welfare states. I want to expand on that point. Johan cited Martin Ravallion, so I tracked down his work. 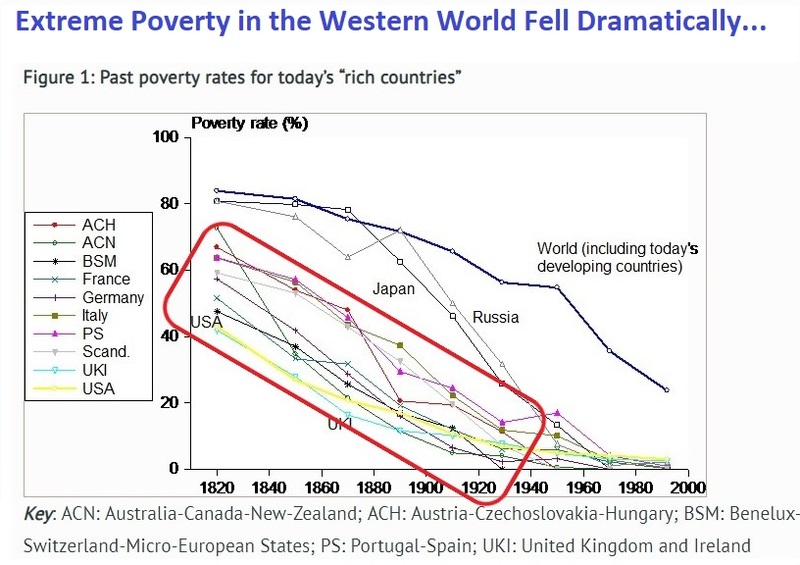 And here’s the chart he put together, which I’ve modified to show (outlined in red) that extreme poverty basically disappeared between 1820 and 1930. That was the period when there was no welfare state. Not only is that apparent from Our World in Data, it’s also what we see in Vito Tanzi’s numbers. Here’s Tanzi’s table, which I first shared five years ago. And I’ve circled in red the 1880-1930 data to underscore that there was virtually no redistribution during the years poverty was declining. The bottom line is that poverty in the western world fell during the period of small government. Yet some people want to put the cart before the horse. They’re making the absurd argument that post-1950s welfare spending somehow reduced poverty before the 1930s. That’s as absurd as Paul Krugman blaming a 2008 recession in Estonia on spending cuts that took place in 2009.
in Chicago… 57 Americans were shot over the weekend… 6 of them shot dead… that in a city which has been under democrat control for the last 87 years… obviously maintaining the rule of law in minority communities has not been a high priority for Chicago democrats…and you have to wonder…………… why? If one accounts for how 75% of welfare spending in the US goes to fund the bureaucracy, it’s buildings, benefits, unions and more, with only 25% getting to the needy, it should not be a surprise that big government welfare solutions don’t work in the third world either. Big government programs thrive on NOT solving anything, and perhaps making it worse. If welfare programs actually solved welfare problems, there would be layoffs and program reductions…. Esteban joined our team in 2016 and is working on economic development, the public sector, education, and a wide range of related aspects. Esteban completed his DPhil in Economics at the University of Oxford. No comments on the article, so if you wish to contact the author he’s at esteban@ourworldindata.org or @eortizospina. Yes, yes, yes. Government does not – cannot – reduce poverty, at least in the long run. The historical data shown here show that to be absolutely true. Why? It’s not so mysterious. Government does not create economic value. Beyond the minimal required govt functions (rule of law, fire, police, judicial, etc), govt can only help poor people by redistributing resources from the private sector. Government can only redistribute what the private sector earns. If the private sector is poor, government can provide little assistance. If the private sector is rich, government can afford more assistance. General prosperity and poverty reduction BOTH rest on the ability of the private economy to create value. NOT government.